Safes Galore presents the Locktech M015 digital security safes featuring an attractive and compact design as well as a 1-hour fire rating. The compact Locktech M015 digital safes are ideal for use in homes and offices to store valuables or important documents. The safe has sufficient space to fit an A4 sized document flat at the base of the safe. A convenient pull-out tray is also provided. Locktech M015 fire resistant home and office safes feature a door fitted with a rear dog bolt that keeps it locked when the door hinges are attacked. 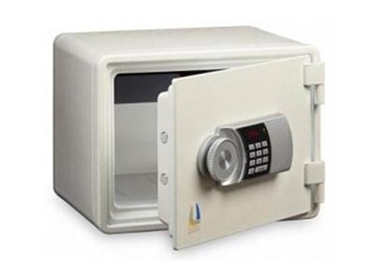 Featuring a solid construction for extra protection against fire and theft, the Locktech M015 safe is easy to install and program, and does not require the services of a locksmith.